Express a timeless affection for your pet with a cat pendant crafted from antique watch components. They say the whole is greater than the sum of its parts. This is certainly true for artist Sue Beatrice's kitty pendant, which was created using non-working antique watch parts from the mid-1800s. Once arranged into its whimsical form, each pendant is then cast in sterling silver and hand-finished with a beautiful darkened patina. 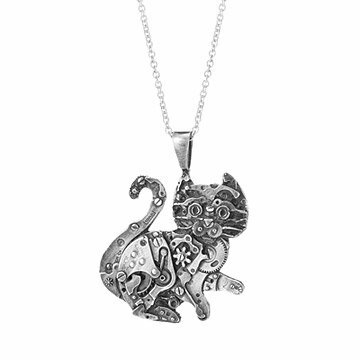 An 18-inch sterling silver chain completes the design and allows pet lovers to keep kitty close to heart. Made in Sea Cliff, New York. Nature inspires Sue Beatrice's designs, but it's man-made creations that really turn her gears. When she creates new heirlooms from old ("I never destroy a watch that works!," she shares), she finds herself "thinking about the lives of the people who once owned the timepieces," a process that helped her evaluate her life goals. Her products hold power over others, too: "Several people have burst into happy tears when seeing pieces designed just for them. It's an amazing feeling to know your art has touched someone's heart." Take a Studio Tour to see where Sue creates her tiny, wearable sculptures! Use a silver polishing cloth if desired. Beautiful piece of art the detail in the kitty is amazing the weight of it is good (not too heavy). It's bigger in person, it comes in a bag and a box so it's also ready for gift giving. Any cat lover/artist or even watch collector? would appreciate this kitty! Sue is a true artist her items are like potato chips you can't just have one!